The greatest day of the year is almost here. And no, it’s not Valentine’s Day. It’s National Love Your Pup Day, a day of double the puppy love and four-legged smooches. Celebrate on Feb. 20 by hopping in your car with Fido in the passenger seat and heading to one of these California hotels where they’re rolling out the red carpet for you and your pup. For guests traveling with four-legged friends, Pendry San Diego allows two pups per room (of any size) for no fee. Pet amenities include a dog bed and dog bowl. Not to mention, a companion for checking out the art, music, design and culture of the neighborhood. It’s a win-win for both pup and human! Located in quintessential North County San Diego, the property offers guest with furry friends (pups 30 Ibs. and under) a personalized Rancho Bernardo Inn dog bowl for guests to take home, treats and doggy waste bags. There is a cleaning fee of $100. As part of Paws at The Garland, four legged friends receive a special box complete with a welcome dog toy, bandana, doggy bowl and snack, and a doggy waste basket with a mini flashlight. In addition, The Garland offers a special dog-friendly area where dogs can roam and explore. Pups will love their special note from The Garland’s two resort pups, Chester and Dexter. The box is available for purchase at the on-site The Store. As part of the Pets Are Welcome program, each four-legged companion receives a special dog-friendly welcome amenity and welcome letter with info about special pet services available through the Concierge and a list of items available at Whatever/Whenever® including leashes, toys, food, treats, litter boxes, wee pads, waste removal bags, a custom W Hotels pet bed with food and water bowls, a ‘pet in-room’ door sign and special treats at turndown. To make your furry guest’s stay even more seamless, the property’s concierge is happy to arrange anything from dog-sitting, dog-walking, vet recommendations, locations of the nearest Dog Parks and Dog Runs, specialty pet stores, grooming services and more. Rancho Valencia offers a special in-room Doggie Tapas menu featuring their favorites: shepherd’s pie, chicken of the sea, rin tin tin tartare, morning risers and barnyard chase – and there are places to play, pet-friendly shopping, grooming and pet sitting nearby. Upon check-in, pet guests will receive a sampling of tasty doggie treats, “clean up after your doggie” bags and a plush doggie bed. Four-legged friends of any size, weight, or breed can soak up San Diego’s warm sun rays with Estancia’s complimentary Furry Friends offerings. Guests can travel well-assured their pets will receive the best treatment and all the goodies to keep them feeling pampered, including plush dog beds, locally-made, grain-free Mutt Munchers peanut-butter treats from Muttropolis and more. At The Meritage Resort, pets are family and this pet-friendly hotel will treat them that way. During their stay, furry friends are provided plush Meritage Resort and spa-branded dog beds, a dog bowl to take home, and a pet amenity bag that includes organic wine bottle-shaped cookies, an assortment of peanut butter bone cookies, and potty pick-up bags. 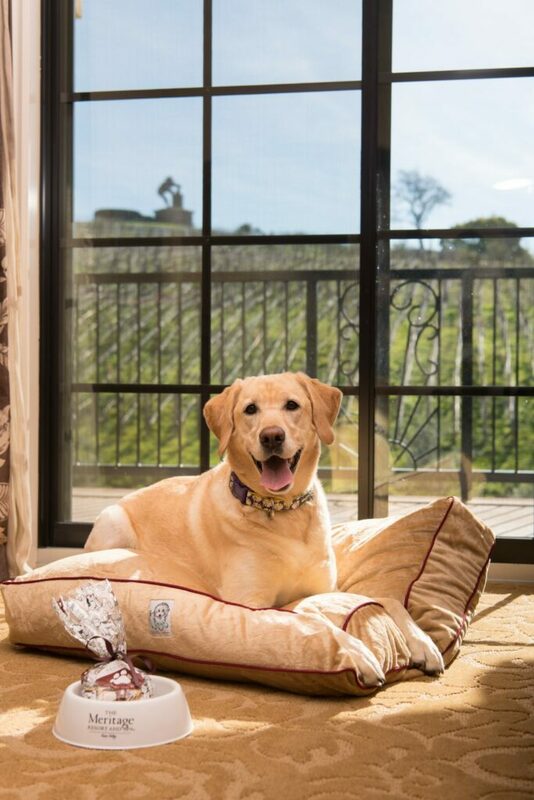 Moreover, The Meritage Resort provides a hiking trail located in its vineyards for pets and their owners to enjoy the sunny Napa Valley terrain together. The resort offers plush pet beds, a dog bowl to take home, wine bottle-shaped treats, peanut butter bone cookies, and potty pick-up bags, along with plenty of scenic space to explore surrounding the property including the resort’s vineyards, Dog Park at Alston Park, Napa River Trail and downtown Napa itself. 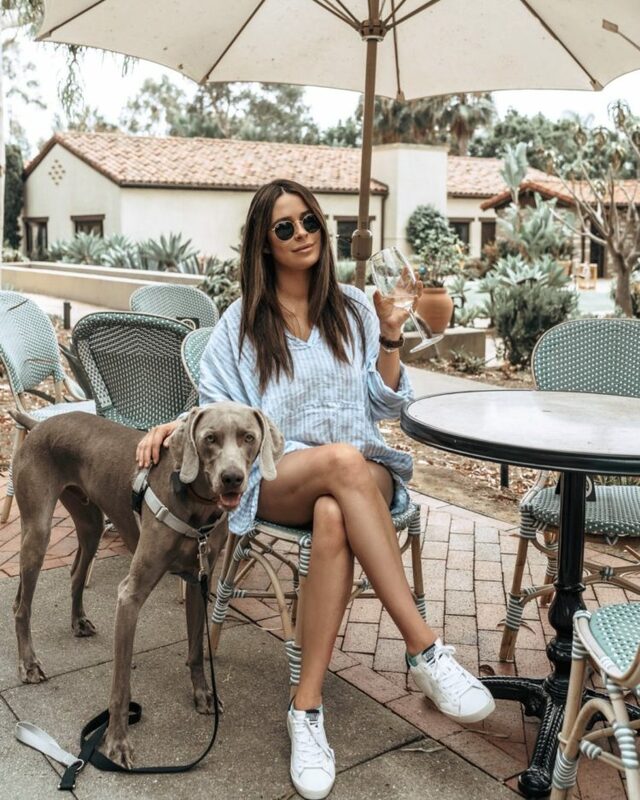 Additionally, guests can book doggy day-care through the resort for days they want to explore, dine or spa on their own, as Vista Collina partners with the neighboring Ruff and WIne Country Pet Resort for day and night-time drop off or dog-sitting or walking. After a long day filled with Del Watersports and sunbathing on the beach relax with four-legged friends at Yappy Hour, every Sunday from 4 to 5pm, and indulge in pet-inspired cocktails like Hair of the Dog, Tangy Greyhound, and Salty Dog while pets munch on complimentary Evian and organic “yappatizers.” Additional pet amenities at The Del include a gourmet room service menu for pets prepared by talented chefs, Del-ightful Dog and Cat Treats upon arrival, pet-friendly guide to Coronado Island, access to Dog Beach located less than one mile from the resort, pet-walking, pet-sitting, dog grooming and veterinary services, water and food bowls, placemats, kitty scratching pad, waste bags and/or litter boxes and more. Pasea Hotel & Spa is conveniently located less than two miles from the famed Huntington Dog Beach where dogs can run leash-free through the waves of Surf City U.S.A. Paséa also recently unveiled its interactive pup play park, The PAW-SÉA, to add to its repertoire of luxe pet friendly hotel amenities. Guests of the hotel will be able to play with their furry companions in a brand new 1,100 square foot outdoor pup play area outfitted with a lifeguard station dog house, a local artist commissioned wall mural featuring dog angel wings for coveted Instagram travel photos, and all the space a vacationing four-legged friend could want. The play park is a fenced-in area where dogs can roam off-leash and will only be accessible to pets registered with the hotel. 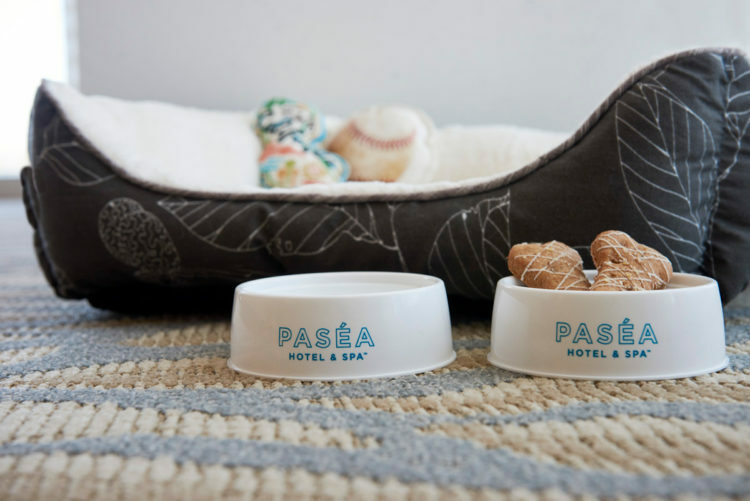 The Pawséa pup park is a growing part of the hotel’s pet friendly travel program that includes in-room bed, food and water bowls, a dog treat welcome amenity, pet gift shop items, and Lago, Paséa’s French bulldog pet concierge.